I was in search of a good guidebook to see me through three days in Paris on pleasure... My search in the bookshops led to the predictably formulaic Frommer's and Fodor's, or the overpriced pretty books which seemed to belong on the coffee table than in the hand of the serious visitor, until I happened upon your Cadogan guide... I snatched it up with great delight, and how useful it was is best judged by the book's worn look after three days of use!... I first discovered the importance of a discriminating guidebook when I spent several summers in the early 1980s, wandering the nook and crannies of Rome, Georgina Mason's Companion Guide in hand, and a smile of satisfaction on my face. 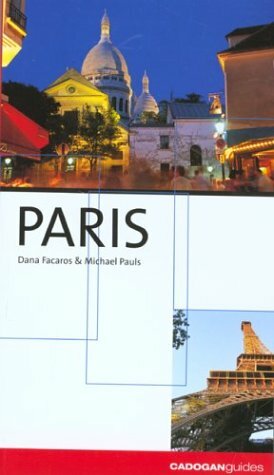 Your book made me recall that pleasure in Paris. ‘All the merit of Paris is in its air,’ wrote one of the city’s great chroniclers, Louis-Sébastien Mercier, in 1781. Air does seem to have a buoyant quality in Paris, a champagne effervescence that toys with gravity and lightens the wit; ideas and fashions rise and float over the city before dissipating into the mists of time; windbags of all sorts proliferate. Innately airy and pumped up with Gallic derring-do, Paris was a natural to pioneer communion with the sylphs. The first Parisian birdman was the eccentric Marquis de Bacqueville, who in 1742 made it halfway over the Seine in a prototype of a sailplane before crashing into a floating laundry barge; afterwards the Marquis challenged anyone who mentioned the incident to a duel. The next attempt had to wait until 1783, when the brothers Montgolfier, after remarking on how their shirts puffed up as they dried by the fire, released their first balloon at Annonay. As soon as the news hit Paris, public subscription raised funds for a similar experiment, released two months later from the Place des Victoires by physicist Jacques Charles. It floated all the way to Le Bourget, where peasants, thinking the gas bag was a monster, shot it down, tied it to a horse’s tail and dragged it across the fields in triumph. Undeterrred, two months later Paris launched the first-ever humans into the air, Pilâtre de Rozier and the Marquis d’Arlandes, who sailed 300 ft over Paris, from the Château de Muette to Butte-aux-Cailles, where they were greeted by a crowd that tore off their clothes in its enthusiasm. Two weeks later Jacques Charles launched the first hydrogen balloon from the Tuileries and stayed aloft for two hours. ‘But what use could it ever have?’ one spectator wondered aloud. ‘Of what use is a newborn baby?’ retorted another, named Benjamin Franklin. Paris’ aeronautic ‘firsts’ continued apace: in 1791 Parisians in the Parc de Monceau witnessed history’s first parachute jump—at 1000 ft, from a balloon. In 1793, the armies of the Revolution made the first military use of balloons, to carry messages over the heads of their astonished enemies. In 1798, the first man on horseback went up in a balloon over Paris; it made the horse’s nose bleed. In the next century, amazing spectacles were performed by the first lady aéronautistes, especially the daring Madame Blanchard (wife of the first balloonist to cross the English Channel), who in 1819 rose high over Paris in a balloon crowned with fireworks; the bag ignited and she perished like a shooting star. In the 1850s, with Victor Hugo thundering inspiration from the sidelines (‘The holy ship...the vertiginous shout of exploration! It races, shadow, light, chimera, vision!’), Paris debated setting up an urban transport system in which balloons, guided by steel cables, would be pulled along high wires over the city by steam engines. For there was a catch- no one had yet invented a way to steer a montgolfière, much to the chagrin of Paris when it was besieged by the Prussians in 1870. Daring balloon escapes over the Prussian lines caught the world’s imagination, although quite often the balloonists themselves were caught too. One that escaped floated haplessly all the way to Norway; another, by an extraordinary coincidence, crashed into a house in Brittany where the aged mother of the general in charge of Paris’ defense was praying ‘for a sign from heaven that her son might save France.’ Yet not one of the 65 balloons launched during the siege was ever able to return to Paris; throughout the siege, the only communication from outside came via pigeons, on microfilm. In 1871, right after the war, Paris got a sneak preview into the future, when 21-year old Alphonse Pénaurd flew 65 feet in a ‘planophore’- the first heavier-than-air machine to get off the ground (if only just). Pénaurd also designed a helicopter and a delta-winged plane-—so that everything will be ready, he wrote, when someone invents the engine to make them run.